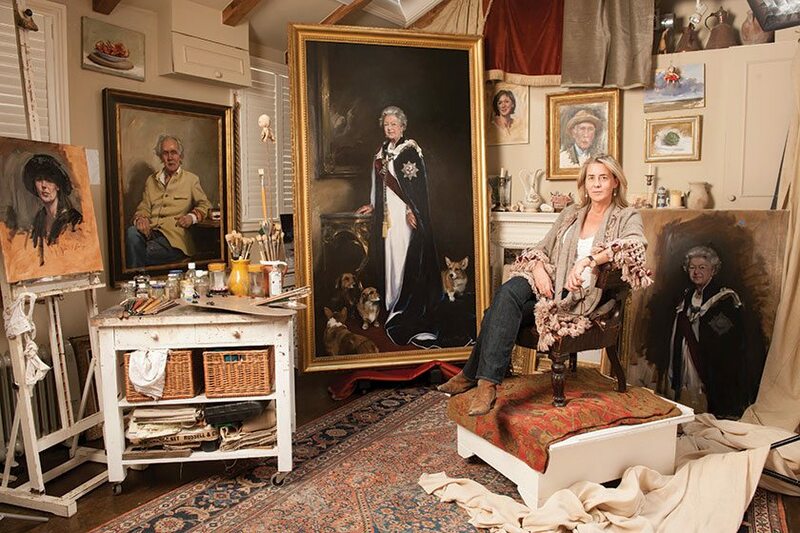 Nicky Philipps painted the Queen in 2011 and Princes William and Harry in 2008. Her portrait of the Queen hangs to the left of the throne in the Throne Room at Buckingham Palace and her portrait of the Princes is in the National Portrait Gallery. She is currently working on another portrait of HM the Queen. ‘It was the Queen’s 134th portrait so I was so impressed by how she chatted away and was great fun. I love horses and dogs too, so, obviously, we talked about those – she has such an infectious laugh, which really broke the ice. ‘In 2008 William and Harry chose me to paint them for the National Portrait Gallery after they saw a self-portrait I submitted to the Gallery’s BP Awards and another portrait I’d painted of a 25-year-old man. I arrived at Clarence House and, in the hallway, I saw Harry sitting casually on a table with his hand on his hip and immediately that fitted my view of how he was. ‘Call me a purist, but as Clarence House faces south, I asked them to come to my studio in South Kensington. What’s amazing is that no one even noticed when they arrived and clanked into my house in full dress uniform with spurs, swords and the lot. So much for Neighbourhood Watch. 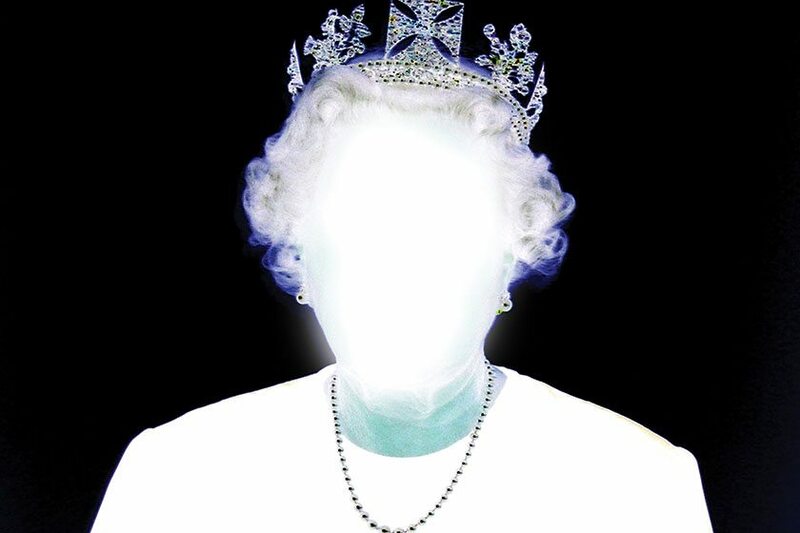 Christian Furr is a contemporary artist who was, at 28, the youngest ever artist to paint the Queen in 1995. His portrait hangs in the public foyer of the Royal Over-Seas League in London. ‘The Royal Over-Seas League used to have an annual open exhibition of young artists and I had submitted a portrait of a guy in a red jacket holding a brush, which led to a commission to paint the Chairman of the Over-Seas League and former director of Air India, Maneck Dalal. I painted Mr Dalal in his garden and it had a slight feel of Matisse to it. ‘Then I received a call from the League’s Director-General, Robert Newell. “Are you sitting down?” he asked me. “The Queen would like you to paint her portrait.” I remember taking the call in the flat I was living in in Surbiton with my girlfriend Emma, now my wife. It was quite a shock but a great honour. ‘I drove to Buckingham Palace in my red VW Beetle with its boot bristling with paintbrushes. When I told the guards I was there to paint the Queen they laughed. 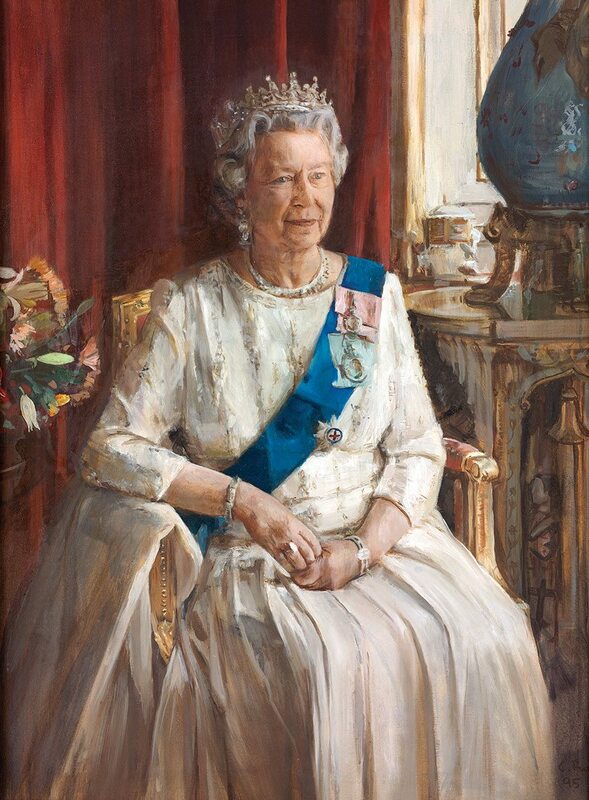 I wanted to paint the Queen quite close up – so many other portraits, including Annigoni’s, had been fairly distant. ‘I wanted the Queen to wear national colours, red, blue and white, and so I’d chosen the Order of Star and Garter dress, which I thought summed her up as both a person and an icon. She also wore the diamond Girls of Great Britain and Ireland Tiara, a gift to the future Queen Mary in 1893. In 1947, Queen Mary gave it to her granddaughter Elizabeth as a wedding present. It has become such a familiar image through its appearance on our banknotes and coins. ‘When the Queen came in she was carrying a blanket and put it on the side of her chair. I included it in the portrait because she’s a human being and I felt it showed an element of vulnerability. It could have been overwhelming as a 28-year-old at the start of my career but she put me completely at ease and I think that comes out in the painting. ‘I had two sittings and she was really chatty, lively and charming. She asked me what paintings I liked. At the time I was really into Gainsborough and Reynolds. “I think we’ve got a few of those,” she said – she has a very sharp sense of humour and I hope I’ve portrayed that in the way she’s smiling enigmatically. She was also very animated and enjoyed the music outside during the changing of the guard. It was nice to see her chilling out. Hugo Rittson-Thomas is a photographer and documentary film-maker. 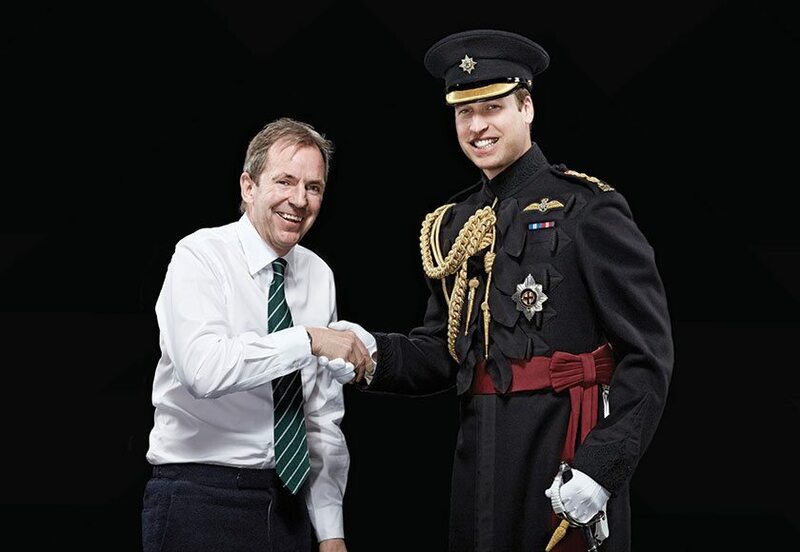 His photographs of the Queen, Prince William and the Duchess of Cornwall belong to a series of photographs entitled The Queen’s People, which show Members of the Royal Household and British ceremonial position holders in their traditional uniform. The Royal Household holds a copy of the prints in their archive. ‘I was commissioned by the Royal Scots Dragoon Guards to take a portrait of her Majesty to celebrate her colonelcy and the Regiment’s 60th anniversary in 2013, so it all came together along with The Queen’s People. It also tied in with the Waterloo celebrations – the Queen is wearing a Waterloo regimental badge in the image. ‘I wanted the photographs to have an element of 17th-century formal portraits with their black backgrounds. I’m inspired by Old Masters like Velázquez but, also, by photographers like Irving Penn, so I used a unique contemporary mirror device that means you see the person from the front, back and both sides. ‘It has never been done before and reinvents traditional court portrait painting. It takes about four hours to build the mirrored box and to light it properly but when it came to shooting the Queen, my camera had a digital seizure, which meant I immediately had a mental seizure. The Queen was totally unflappable and very understanding. I said it would take a couple of minutes to fix the camera and this was my cloud’s silver lining, as we started chatting about other things and I was able to explain the purpose and process better. She made me feel like she had all the time in the world – she was so generous. Aged just 31, Isobel Peachey was commissioned by Cunard to paint the Queen for the launch of the liner Queen Elizabeth in 2010, where it still hangs. 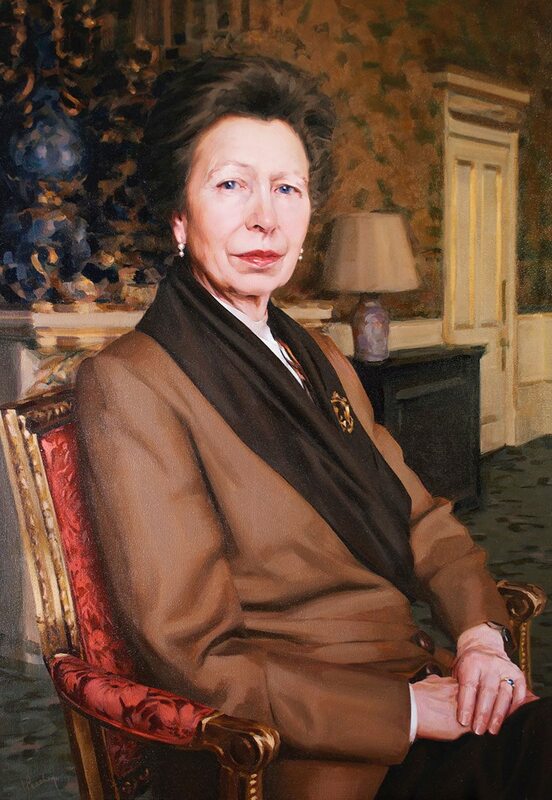 Her portrait of Princess Anne was commissioned by the Royal Society of Arts when she succeeded her father as President there, and the portrait hangs outside the Great Room, over the top of the staircase. ‘In 2008 I painted a portrait of a childhood friend, which was selected for the 2009 BP Portrait Award exhibition. Meanwhile, Cunard had approached the Director of the National Portrait Gallery, Sandy Nairne, to commission a portrait artist. Shortly afterwards I received a vague email asking me to go to an interview without telling me who the sitter was. ‘At the interview, they wanted to see my portfolio and asked lots of questions about how I’d go about painting a portrait. They also asked if I needed anything in particular when painting a portrait. “A nice cup of tea to chat over is great to settle the nerves and relax the situation,” I said. Then they told me they were looking for an artist to paint the Queen. I remember feeling shocked because it had never occurred to me that it would be such an important royal commission. I felt very honoured but didn’t expect anything more to come of it as I was 31 and just starting out. ‘After winning the BP Travel Award 2009 a few months later, I got a call from Cunard to tell me I had been awarded the commission. It was surreal but wonderful. ‘At Buckingham Palace I had three sittings in the Yellow Drawing Room and I was able to sketch and photograph it beforehand, as it has beautiful ornate gilding from floor to ceiling. Cunard wanted the Queen to look welcoming and homely, as well as regal, so they suggested having the grand fireplace in the background. ‘They did bring me the cup of tea and the Queen asked me lots of questions about my career, my background, other commissions and plans for the future. These exchanges allowed me to build up a picture of the Queen that I couldn’t have possibly got from a photograph or other media. It was important to see her body language and build up a true picture of her. ‘It was a strange experience because I had gone from painting people I knew really well personally, to the most well-known person you could imagine and I felt a huge weight of expectation – from the Queen herself, from Cunard and from the public. It taught me a great deal and was a turning point in my career as portrait painter. ‘The portrait was completed in my studio at the top of my parents’ house. As I wasn’t allowed to tell anyone who I was painting I had to keep the door locked. My friends kept asking, “Why the secrecy?” and if I had a dead body in there. Eventually, when I was able to tell them, they were shocked and happy for me. I invited my closest friends and family to the official unveiling at the National Portrait Gallery and having them there really made my evening. ‘The first time the Queen saw the portrait was on board the Queen Elizabeth liner on the day she named and launched it. I was standing next to the portrait as she came down the grand staircase and when she saw it she giggled. She asked me if it had progressed how I’d wished and although she never comments on her portraits I felt she approved. ‘When Princess Anne became President of the Royal Society of Arts, Sandy Nairne was asked to advise on a portraitist and my name was put forward. Again the sittings took place in the Yellow Drawing Room but this time there was no formal brief. Chris Levine is a pioneer in the field of light art. 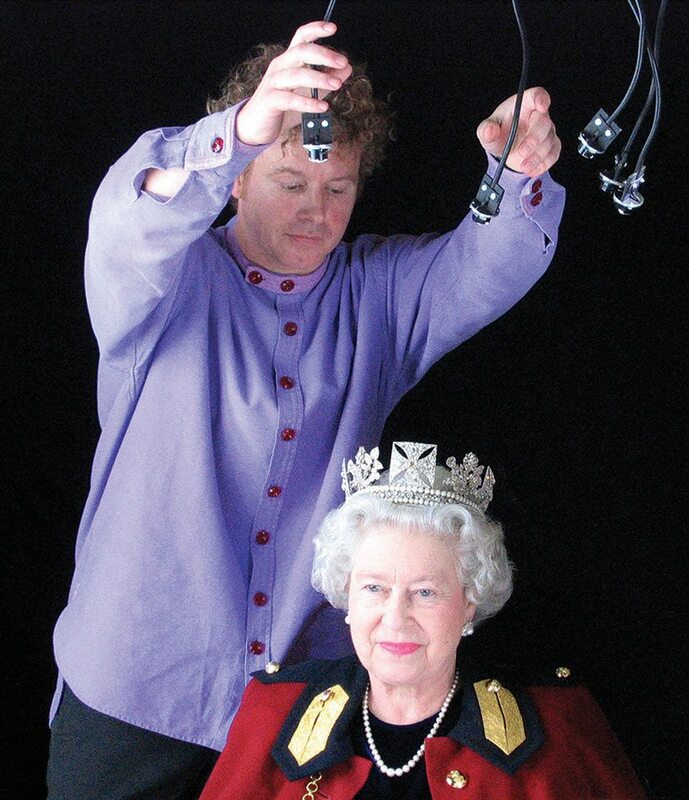 In 2004, to mark 800 years of Jersey’s independence from France and allegiance to the Crown, Jersey Heritage Trust commissioned Chris to do a portrait of the Queen. The hologram Equanimity remains at Mont Orgueil Castle in Jersey and also appeared on a holographic £10 Jersey stamp and £100 banknote. The sitting resulted in a body of work, including Lightness of Being, that has made Chris internationally renowned. ‘The call came out of the blue. I think I was put out there as a bit of a wildcard by artist Gordon Young, who curated the commission and was behind the whole idea. It didn’t need to be an oil painting, so Jersey was obviously looking for something different and contemporary. ‘I thought, “This can’t be for real.” I went over to Jersey and thought there’d be circles of bureaucracy and lots of people sticking their oar in but, actually, I was entirely left to my own devices. However, the fact that the client was so trusting made me feel hugely responsible to create a worthy item. I asked for a selection of capes and as soon as she put the ermine one on, it was if someone had spoken from above – there was the image. ‘I wanted to make an icon and distill the image down to its purest essence. So I chose one string of pearls, not three, and the cross in her diadem is so beautifully simple. I took every opportunity to pare the image right back and simplify it. I asked for a selection of capes and as soon as she put the ermine one on, it was if someone had spoken from above – there was the image. ‘I was offered a second sitting and then it became so much more than just one image. I made subtle changes in the way I positioned the camera and lights for a much softer feel. At the time I was just getting into meditation and thought about how it could affect our whole evolution as a species. I’ve been on about ten retreats and taken a vow of silence, and I really wanted to share what I felt about meditation’s power. ‘It’s all about equanimity and I wanted that to be the title of the portrait, as it seemed so appropriate in terms of the image. I asked the Queen how she felt about that and she agreed it would be appropriate. ‘She was under a lot of bright lights and the camera was moving along on a track. I suggested she rested her eyes while we reloaded and that out-take with her eyes closed between takes was the image that resonated – pure magic. the images have been all around the world. ‘The original commission with her eyes open is the one that ended up on the cover of Time magazine in 2012 and on the banknotes. The banknote is so beautiful with the Annigoni portrait as part of the watermark. I was blown away. ‘At the National Portrait Gallery my pictures bookmarked the entire exhibition of 60 portraits of the Queen – starting with her eyes open and then, at the very end, next to a portrait by Lucian Freud, with her eyes closed. Amongst so many iconic artists, I’d just expected my work to be in a corner, so it was surreal and I felt very honoured, especially as they also used my image for the catalogue cover. 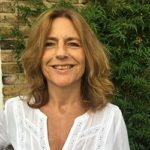 Charlotte Metcalf is a journalist, an award-winning documentary film-maker and the author of ‘Walking Away’, a book about her time making films in Africa. For Country & Town House she writes about everything from artists, writers and designers to Wellington boots, shooting and castles. She’s interviewed a variety of extraordinary and accomplished women like Alice Temperley, Vitalie Taittinger, Yasmin Le Bon, Helen MacDonald, Kelly Hoppen with daughters Natasha Corrett and Savannah Miller and Emma, Duchess of Rutland with her three daughters Lady Alice, Lady Violet and Lady Eliza Manners.